Throughout our life we are asked “How are you?” in numerous variations of the phrase. It comes out in everyday conversations with retail workers, family members, friends; the list goes on. However, more often than not, when asked this question, we default back to the simple and safe answer of “I am okay”, before turning the question onto them. This could be because we are constantly on the go and have little to no time to indulge into a full-fledged conversation. Or we feel that it is not the right time or place to go into detail about our life. Whatever the case may be, we end up saying “I am okay”and end up walking away from the conversation a few moments later. And quite frankly, it isn’t our fault that we were conditioned to give this automated response. Although sometimes this could be the absolute truth, that life is merely okay and there is no other word in our vocabulary to describe it. But then, there are those times when everything seems to be falling down around us, and we refuse to acknowledge or confess that life is giving us a bag full of lemons and we have no idea what to do with them. So we end up saying everything is fine or okay, when it is actually quite the opposite. During hard times, this phrase departs from its original meaning and becomes a temporary mask. It transforms into a hiding place that barely anyone can find and oddly enough, it’s comfortable there. This phrase becomes a safe haven for the individual who is unable to comfortably express their situation to others. For some, they feel a heavy sense of burden approaching even their closest friends and admitting that they would like an ear to listen to them or a shoulder to cry on. Others may bottle up their emotions inside and continuously work hard to create an unbreakable wall that has the ability to keep everyone, and everything, out. 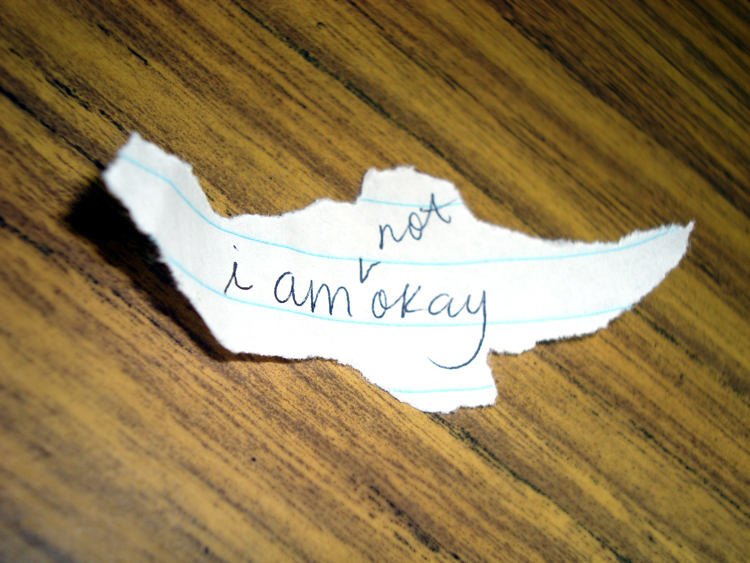 Because of these reasons (and obviously many more), we settle on the simple, yet painful lie of “I am (not) okay”. Now, when was the last time that you actually thought about your response after being asked “How are you doing?” How honest are you with yourself when asked the question “Are you okay?” Living in such an emotionless world can prevent us from being honest with others, and more importantly being honest with ourselves. We don’t want to come off as emotionally unstable, but we also know that we’re not robots. Sometimes it really is better to admit to people, and to ourseleves, that maybe things aren’t so great, yet you’re making strides towards being better. It’s okay to not be okay. According to merriam-webster.com, the word ‘first’ is classified as an adjective, adverb, noun, and even a pronoun. Depending on how it is used, the ‘first’ can be used to imply different things. But when we hear or see it, the first things that come to mind are specific moments or events in our life. As we grow older, we are able to look back on our never-ending lists of firsts; like the first time riding an airplane, the first time getting paid, the first time falling in love. We often associate the word ‘first’ with a joyous occasion, something that brought out a reason for celebration. And that is true. Why should we be prohibited from celebrating our first semester in college? Or even the first time we successfully drove home- by ourselves! These are the moments that we hold dear to our heart, the moments that when recalled bring a smile to our face. But as with every good, there is something on the opposite end of the spectrum, the undeniably bad. Of course, these ‘firsts’ are hidden deep underneath our skin and leave us hoping that they will never again see the light of day; like the first time breaking up, the first time someone we loved passed away, or even the first time we thought we were not good enough. These, and many more, remain engraved in our hearts and causes our eyes to become slightly moist at the very thought. There are undoubtedly many good ‘firsts’, but there is also an equal amount of bad. It is important, however, to remember that we as human beings are a culmination of firsts- both good and not so good. And that is okay. Because in retrospect, we may have a ‘second’, maybe a ‘third’, or even a ‘fourth’. But we will always have our ‘first time’ as a guideline, a standard that we can continuously improve on. The first anything is a gateway to something bigger- and all we need to do is remember that. Everything in this world has an ending. Lifespans, fashion trends, calendars, all these have an ending, whether it can be visibly seen or hidden in the mysterious fog of the unpredictable future. But how could there be an ending, if there is no beginning. Just like it’s counterpart, the beginning can come in many different forms: a single sentence, an abstract idea, or even in the form of a stranger waiting at the bus stop. The beauty of ‘beginnings’ is that it does not need to be perfect. Beginnings are like footholds on the side of a mountain. At times they look steady and reliable, providing a sense of trust and assurance that everything will be fine with each step. And then there are those that appear fragile and dangerous, causing one to question every step that they take. But no matter how many times you slip and lose your footing, you must get over the beginning in order to reach that desirable ending.